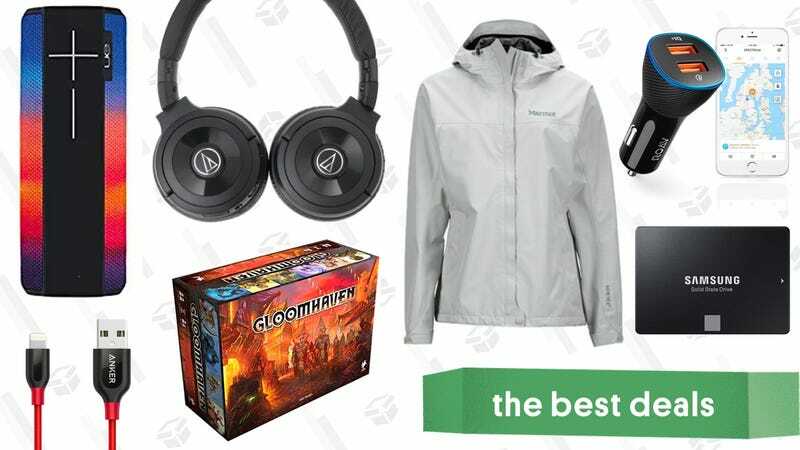 The world’s top-rated board game, our readers’ favorite over-ear headphones, a Marmot sale, and more start off today’s best deals. The original reader-favorite Yi action cam has spawned an entire product line, and the new entry level model just got its biggest discount yet. The Yi Discovery lacks the electronic image stabilization of the more expensive Yi Lite, and can only take 8 MP stills compared to 16 MP, but they both shoot 4K/20 and 1080/60 footage, and at just $45 with promo code YIDISCOV, the Discovery is worth checking out if you just need a rugged camera that can handle the basics. While AirPods offer the most seamless headphone experience for iPhone owners, BeatsX are probably a close second, and you can get a pair for an all-time low $90 today on Amazon. It’s not the newest model, but if you’ve seen the drool-worthy 5K screen on an iMac at the Apple Store, and wanted one for yourself, today’s Gold Box deal on Amazon is worth a look. This 2015 model includes a 2TB Fusion drive (which combines a smaller SSD with a larger spinning hard drive), AMD Radeon R9 graphics, a quad-core i5 processor, and of course, that stunning 5K display, all for $1,450. It’s not an apples-to-apples comparison, but the nearest equivalent model from the current lineup would cost you $2,000 at the Apple Store. The Mars II puts out a 720p picture of up to 150", is three times as bright as the Capsule at 300 lumens, and can run for four hours on a charge, meaning you could watch a double feature outdoors without having to plug it in. It’ll normally sell for $540, but since it just launched, you can save $100 today with promo code NEWMARS2. Today’s $60 deal is an all-time low by over $10, but it’s only available today. These normally sell for $8 or more, so don’t miss your chance to take a bite out of this deal. Update: Now down to $45! Wolfenstein II is a very good and depressingly relevant game, and it’s a no-brainer for $20 if you don’t already own it on PS4. This was one of Black Friday’s top sellers at $25, and this is the first time we’ve seen it cheaper. You’ll likely make your kids’ whole year when you buy them one of these discounted power wheels from Amazon. They start at just $60 and go all the way up to $300 for this fancy Batmobile-like car. Just note, this sale will only last through the end of the day or until the products sell out, so don’t wait for these discounts to drive off.